Home Taping / Taping music off the radio was rife in the seventies and eighties. 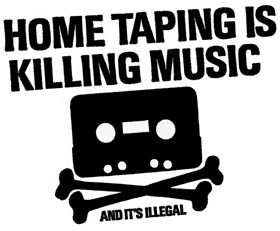 On the inner sleeve of almost every record sold in the 80s was a skull-and-crossbones and the legend “Home Taping is Killing Music”. In the early 80s the charts were as packed with musical nourishment as a trombone pie. Status Quo’s “Caroline”, released at the end of 1982 sounded good, and Quo followed this up with “Ol’ Rag Blues” in September 1983 but my 50p weekly pocket money stretched only so far, leaving tragically little to spend on records after chocolate-related expenses. Instead, like everyone else I knew, I turned to crime. It started innocently enough – a borrowed blank cassette from my parents, and later, after an unfortunate incident involving my recording over a favourite Cliff Richard album of my mother’s, I scraped money together to buy my own cassettes. Buying tapes was not illegal, but recording the Top 40 countdown on Radio 2 on Sunday evenings at 6pm was. Radio 1 was still only broadcasting on crackly mono AM (unbelievably the BBC didn’t broadcast pop music i.e Radio 1 on FM until 1988), so this was the only way to get a decent recording of the latest tunes. Actually it was more than that. It was a chance to hear Status Quo, David Bowie’s “Modern Love”, “Mama” by Genesis and “Wings of a Dove” by Madness without also having to listen to “Red Red Wine” (UB40), the god-awful “Tonight I Celebrate My Love” by Peabo Bryson and spirit-sapping “Come Back and Stay” by Paul Young. For me, taping the Top 40 was as much about dismissing what I didn’t want to hear as listening to what I did. Confirmation that I had no critical faculties whatsoever however, can be evidenced by the fact that I don’t even remember hearing cast-iron classic “Blue Monday” by New Order which was in the charts around that time. So the ritual began with my fingers over the “pause” and “record” buttons of my tape deck: C90 in place (or D90 if I’d splashed out an extra 30p for the better tape) with the trick being to start recording in the nanosecond between Tommy Vance’s voice ending and the record beginning. I would then repeat the trick as the record either faded out or stopped abruptly. My Dad’s stereo had a knob to control the recording level, so with this nifty extra feature I could slowly fade the song out by slowly moving the knob from ten to zero before Vance came back in. Sometimes I would fade too quickly or too late and as a result the sound levels on my mix tapes had all the consistency of the England batting line-up. The resulting mixtape of course was often a bizarre mish-mash of styles. One of my tapes contained Haysi Fantayzee, Men at Work, Madness, Jo Boxers (who were doing the “Boxer Beat”), David Bowie and Van Halen’s Jump. A sort of Now! compilation – only with half the songs missing a beginning, an ending, or both. On my next post I will list the Top Ten Golden Rules of Home Taping for anyone still stuck in 1983..